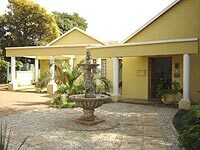 Rozendal Guesthouse offers superb affordable accommodation for the tourist or business person. As a member of the Centurion Bed & Breakfast Association, we take great pride in our quality staff and high service levels. We offer spacious bedrooms each with en-suite bathroom, MNet and DSTV as well as tea/ coffee facilities and wake-up calls. A hearty traditional breakfast is served in our inviting dining room or on the lovely patio. A comfy lounge with fireplace, patio with braai facilities, secure parking, dinner by arrangement, laundry service, and newspaper daily. Assistance with travel arrangements to and from airports and other tourism destinations, postal service, fax and e-mail. Conference facilities for up to 30 people. We are ideally situated in Centurion, in close proximity to Pretoria (10km), Midrand/ Samrand (15km), Gallager Estate (20km), Johannesburg (35km), Pilanesberg (150km). Local: Supersport Park (Cricket), Securicor Loftus (Rugby), Hospitals (walking distance to Unitas), Air Force Base, Embassies and Union Buildings, State Theatre, Rietvlei Nature Reserve and hiking trails. The Voortrekker Monument, Smuts House, Cullinan Diamond Mine, SA Mint and Coin World, Centurion Lake and their Musical Fountain.